After a hiatus of a couple of years and a divorce from G-Unit, everyone's favorite street-hop artists from Brooklyn are back with another album full of street anthems. The Mash Out Posse may be best known for Ante Up which has become a de-facto breakdance/pop cultural icon but the Posse still remains as hood as ever and Sparta just aims to bring that feel they are known for back for 2011. Here is my album review of Sparta, by M.O.P. . 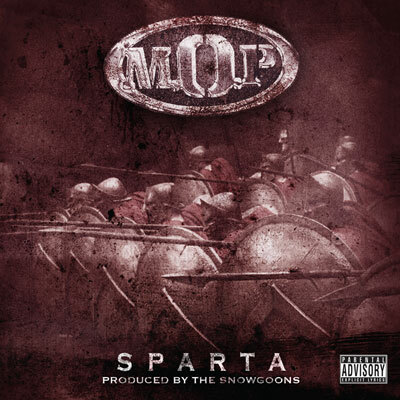 The album opens with "Sparta" and it does bring a certain drama to the album with the track which manages to add some feel to the normal MOP style that reminds me of a march from 300. Fame does spit some flame on this track. "Back At it" is just what it is, a throwback to what the Posse has been known for with a Rocky-esque melody laying the back drop for the track. Meanwhile "Get Yours" is the feeling of an older Busta Rhymes bringing out the elephants and just stomping on some dudes track but the energy from the first couple of tracks isn't evident. The trie "Blasphemy (Blast 4 Me)" is more annoying because of the title, the song isn't bad but it lacks any panache. This is an album that is more about doing what you do best and songs like "Body on the Iron", "Hard Niggaz", and "Break Em" are just more of the same, an exercise in standard Mash Out fare with beats that feel big and large and straight forward lyrics that aren't very imaginative. "Opium" has a decent standard beat but once again we already know M.O.P. isn't going to talk about anything but being true, real and holding down the streets. If more artists could pick the general album filler tracks like M.O.P. then they would be better off. As it stands, M.O.P. is solid but nothing stands out with the strength and urgency of "Ante Up". If you're an MOP fan you've been waiting for this, but you could listen to any of their albums and get the exact same thing and damn near the same sound. The duo doesn't even use trendy punchlines to date their music so they could run their first album back out and get the same exact response. While they are much needed to counter the emo-scene, M.O.P. unfortunately doesn't have enough growth or things to talk about at this stage of their careers to really make a mark with this album. Is 2 Chainz worth an argument?